The mortgage terms you choose could have a dramatic effect on your ability to retire early. Here's why. With interest rates close to record lows, it's pretty cheap by historical standards to finance the purchase of your home. Still, a traditional 30-year mortgage can easily cost you hundreds of thousands of dollars in interest over the life of the loan. By using either a 15-year mortgage or an accelerated payment plan, you could save thousands in interest and eliminate a big monthly expense -- both of which could make a huge difference in your retirement savings, as well as your ability to retire early. 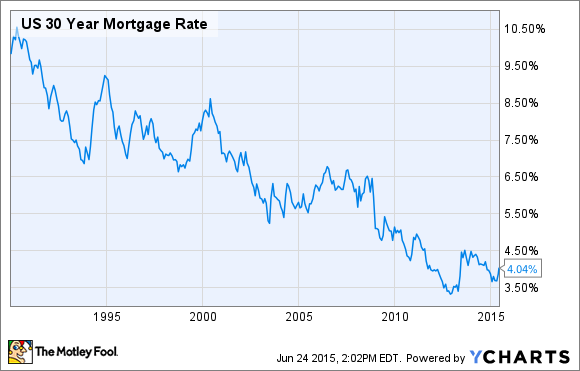 My mortgage costs how much? Many people, particularly first-time homebuyers, are shocked when they find out how much a 30-year mortgage actually costs -- even with a low interest rate. For example, let's say you plan to buy a home with a $200,000 mortgage. Assuming your credit is good; you can expect an interest rate of approximately 4% on a 30-year fixed rate mortgage-based on the average interest rates as of this writing. While this sounds low, and it is on a historic basis, this loan will cost you nearly $144,000 in interest alone. And check out the effect if interest rates increase, as they are widely expected to do over the coming years. While mortgage rates in the 6-7% range might sound ridiculously high right now, they are actually not too out-of-the-ordinary on a historic basis, and chances are good we'll see them again someday. So, once rates start to rise, it's even more important to be aware of how much mortgage interest you're paying, as well as the money-saving alternatives available to you. A 15-year mortgage obviously has its drawbacks. Your monthly payment will be higher, which means you'll be able to qualify for less "house" and your budget might be a little more stretched. However, a 15-year mortgage packs a one-two punch that makes it a great option over the long run. First off, the shorter amortization schedule means you'll pay less in interest. Plus, 15-year mortgages come with significantly lower interest rates than 30-year mortgages, producing even more savings. For comparison, a 15-year mortgage at the current interest rates would only cost about $52,400 in interest, or 64% less than the 30-year option. And the monthly payment would be just 47% higher, even though the balance would be paid off in half the time. So, if you're 45 years old, choosing a 15-year mortgage could mean the difference between owning your home free and clear once you retire, or having to make mortgage payments until you're 75. This could be a particularly effective strategy to cut living expenses for those who'd like to retire early. And, if you're younger, this will mean more time you'll be mortgage-free, during which you can use your extra money to save for retirement, send your kids to college, or for whatever else you want to do. If you aren't ready or willing to make the sacrifices associated with a 15-year mortgage, a biweekly payment plan may be a good choice for you (admittedly, this is what I use for my own mortgage). As the name implies, a biweekly payment plan means that you pay half of your mortgage payment every two weeks instead of once a month. And while this may sound like the same thing at first, remember that there are 52 weeks in a year, so you'll end up making 26 half-payments (or a total of 13 full mortgage payments). You may be surprised at how the savings resulting from one extra mortgage payment per year can add up. In our example of a $200,000 mortgage at 4% interest, the monthly payment (principal and interest) would be $955. And let's say that including taxes and insurance, the amount you actually pay each month -- which will be the amount of your "extra" payment -- is $1,200. Well, by applying an extra $1,200 per year to your mortgage, you'll end up saving nearly $26,000 in interest over the life of the loan. And perhaps even more significantly, you'll own your home free and clear five years sooner. So, if you want to retire at say, 60 instead of 65, this could potentially make all the difference. Since most Americans get paid on a biweekly schedule anyway, it seems like a no-brainer to simply have half of your monthly mortgage payment debited on payday. In terms of your everyday lifestyle, you probably won't even notice the difference, and you'll build equity in your home at a faster pace. In a nutshell, by paying off your mortgage faster, you'll save tons of money over the long run that could be put toward better use (like saving for your retirement). Sure, interest rates are low enough that carrying a 30-year mortgage to term isn't the worst decision you could make. After all, you could theoretically just take the savings from your lower mortgage payment and put it into an IRA or similar retirement account and boost your retirement nest egg that way. However, if you want an automatic money-saver that also builds equity, and will help eliminate a large monthly payment from your budget, one of these alternative mortgage options may be right for you.